The St. Pete Craft Heroes are a HUGE supporter of non-profit organizations in our community and are on a mission to support the DIY Craft Movement. Please be sure you have thoroughly completed the vendor application and have read the event details including the liability release. Be sure to indicate on your application if you desire to share a space with another vendor and have your partner do the same. Vendor Details: $100 includes both days for a 6X6 space. The Studio @ 620 has an excellent security system with alarm so vendors can feel confident in leaving their work over night. Helpful Hint: You may want to review images posted on the Craft Heroes website, http://www.craftheroes.com/, to get an idea for the types of vendor displays and styles of products that have been exhibited during past events. While the Craft Heroes are always looking for new vendors with fresh creations, there is also a certain "flavor" that has come to be the standard at Craft Heroes events. A quick check of past shows may help you know if you're on the right track. Now What? The St. Pete Craft Heroes events are fun and for that reason many many vendor applications will be submitted, far more than the event location can accommodate. Please be aware that spaces are NOT assigned on a first come first served basis, so if you're applying close to the deadline you are not out of luck. Vendors are selected based on creativity of display, type of product, and quality of work. Keep in mind that some product categories fill quickly, such as jewelry for example, because many artisans work in that medium. Please be patient! The Craft Heroes are vendors too and they know the suspense can be agonizing wondering and waiting to see if you've been accepted into a show. You will receive a brief email confirming your status either way within 3 weeks of the application deadline. Be aware that once accepted into the show there are no refunds of registration fees and no transfer of space assignment to another vendor. As the event date draws closer additional set up and show information will be distributed to all confirmed vendors. The Important stuff: Submitting an application indicates you agree to hold harmless The St. Pete Craft Heroes and The Studio @ 620 and their agents with regard to any type of loss or damage to product or personal injury. Save the date for Holizaar Deux! The St. Pete Craft Heroes will soon be accepting vendor applications for their second annual holiday bazaar. The 2009 show, Holizaar Deux, will again be held at The Studio @ 620 (http://www.studio620.org/) Due to the success of last year's event the show has been expanded to span a weekend instead of a single day. so save the date and keep an eye out for online application information. yART sale May 31! Great Deals on Great Art & Crafts!! 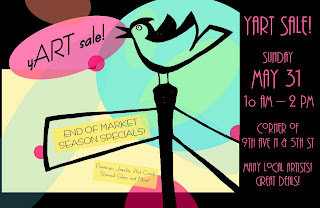 Don't Miss the yART Sale on Sunday May 31st !! 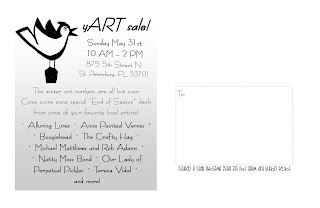 The St. Pete Craft Heroes (Crafty Hag and Boogiebead) are teaming up with a special few fellow artists and crafters to bring you a day of fantastic deals : The yART Sale--its like a yard sale, but with ART! Crafty Hag stained glass will be Buy One Get One, and all of the vendors will have great deals too! Boogiebead: Fun beaded jewelry and accessories and PLUSHIES!! Our Lady of Perpetual Pickles: The name says it all! Home canned goods! Teresa Vidal: Jewelry, paintings, vintage goods and more!